Prevent Cancer Now » Turmeric – Heal thyself! My spice cabinet doubles as a medicine cabinet and contains a big jar of turmeric powder, a regular part of my diet. This bright yellow spice comes from the root of the plant Curcuma longa, a relative of ginger, and grows in warm climates. It is the main ingredient in curry powder and it’s found in both the cuisine and traditional medicine systems of India, China and other Asian countries. Turmeric has a long list of traditional medicinal uses and is a favourite among herbalists due to its effectiveness as an anti-inflammatory, used to treat conditions such as arthritis, injury, asthma, ulcerative colitis, Crohn’s disease, skin disorders, elevated cholesterol, liver disease and cancer. Both turmeric and curcumin, a standardized extract from turmeric root, are some of the most researched natural health products worldwide. Conclusions from in vitro studies and clinical trials strongly support their traditional uses. Studies suggest that turmeric has value in the prevention and, in some cases, the treatment of cancer. It is well established that cancer is a multi-factoral disease, and that its growth and spread is the result of the disruption of multiple cell signaling pathways in the body. According to research, and as cited on the website of the American Cancer Society, turmeric appears to influence many of these pathways, helping to inhibit the development, growth, and spread of the disease. Turmeric has been popularized among herbal practitioners by the work of American herbalist Donald Yance who specializes in cancer care and prevention. Just as small exposures to toxins can accumulate in the body and over time lead to cancer and other degenerative diseases, small, regular doses of herbs and spices can have a protective effect. I have found the best way to use turmeric for cancer prevention is to include the powder in the diet. As a preventative dose I recommend ½ – 1 tsp. 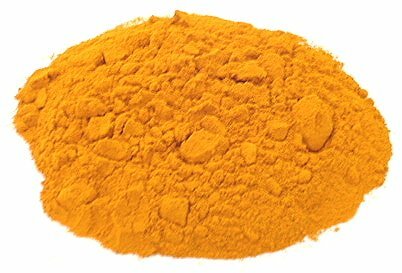 turmeric powder daily. It is better absorbed when mixed with olive oil. The following recipe is a staple in my diet, a sauce that can be kept in the fridge and used as a seasoning with just about anything – a simple and delicious way to get your daily dose of this powerful spice. Combine all ingredients in a 250 ml glass jar with lid. Shake well before use. Refrigerate. A jar this size will usually last one person for one week or less. Pour it over cooked beans, rice and other grains, steamed veggies, white fish, or burgers. Enjoy!